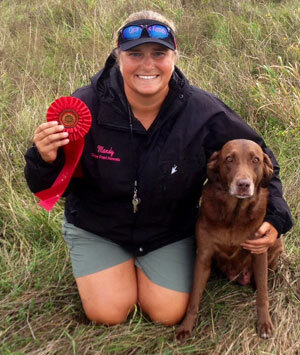 2nd Grand Pass and Grand Hunting Retriever Champion title at 2013 Fall HRCH International Grand Hunt Test! Qualifier for the AKC 2012, 2013, 2014, and 2015 Master National! 1st Grand Pass at the Fall 2012 HRC Grand in Oklahoma! GRHRCH UH Pirate's Myle High Booty MH ("Mylee") shows a ton of talent. Mylee passed her first started test at 3 months, had her HRCH before 2yrs, and was a MH at the age of 2. She also picked up her 1st Grand Pass at the 2012 Fall HRC Grand in Oklahoma. She picked up her 2nd Grand Pass at the Fall 2013 HRC Grand in Iowa. 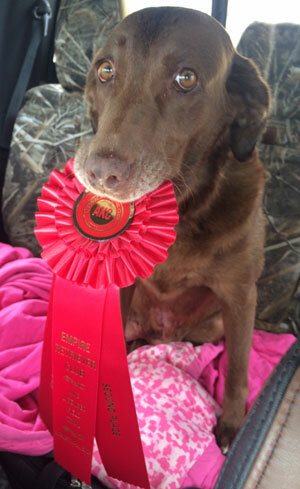 She has also completed her HRC Upland Hunter (UH) title during the 2013 spring hunt test season. Mylee is also a member of the HRC 1,000 Point Club! Not only does Mylee have an extremely strong pedigree, but she is one of the most consistent dogs that we have seen. No matter if she is training or at a test, Mylee shows up. She is an unbelievable marking dog, but she also runs great blinds. She loves the long bird. She has hunted from the rivers in Colorado, all the way to the pits in Mississippi. She is quiet and patient, waiting for the birds to come. She normally has spotted them before anyone else. She loves to work and hunt. But she is also a great mama dog. She is 55lbs of pure speed and muscle.